"I can't play anymore I can't hit the ball when I need to. I can't steal second when I need to. I can't go from first to third when I need to. I can't score from second when I need to. I have to quit." - Mickey Mantle (retirement press conference on March 1, 1969). 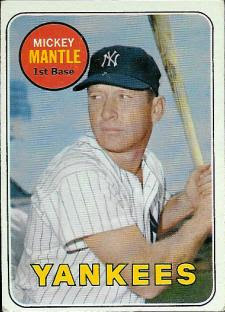 This was Mickey Mantle's last regular issued Topps card as an active player. By all accounts he was one of the greatest players the game has ever seen. In fact there are people who will passionately argue he was the greatest of all-time. I'm not one of those people. Granted, I never saw him play and almost everything I know of the man and the player comes via second hand information, but I can't help but think that this is a man who wasted his talent by taking it for granted. Later in life, Mantle attested to this with deep regret for some of the choices he made during his life and playing career. But don't take my word for it, read his own words in this excerpt from an April 18th, 1994 interview with Sports Illustrated, "My last four or five years with the Yankees, I didn't realize I was ruining myself with all the drinking. I just thought, This is fun. Hell, I used to see guys come into Yankee Stadium from Detroit or Chicago; they'd be out taking batting practice, all of them with hangovers. But today I can admit that all the drinking shortened my career. When I retired in the spring of '69, I was 37. Casey had said when I came up, "This guy's going to be better than Joe DiMaggio and Babe Ruth." It didn't happen. I never fulfilled what my dad had wanted, and I should have. God gave me a great body to play with, and I didn't take care of it. And I blame a lot of it on alcohol." I know from personal experience in my own family that alcoholism is a disease but I think Mickey's own words speak volumes to make my original point. What can not be denied is that Mickey Mantle has ruled The Hobby for over 50 years and while it certainly isn't his fabled '52 Topps or '51 Bowman, it's still a decent conditioned Mickey "Fricken" Mantle. You can read the complete SI interview, which really served as his autobiography here.